Oregano is an aromatic herb closely associated with Italian cuisine, though it is popular throughout Mediterranean cultures. Often used to flavor sauces and roasted meats, it is a key ingredient in many tomato based sauces, especially for Pizza. Often sold and used in a dried form, it is a popular plant in home gardens. Strong in flavor, too much oregano can make a dish bitter and almost numbing to the tongue. Oregano is a perennial herb, growing from 20–80 cm tall, with opposite leaves 1–4 cm long. The flowers are purple, 3–4 mm long, produced in erect spikes. It is sometimes called Wild Marjoram, and its close relative O. majoramum is then known as "Sweet Marjoram". Choosing: Choose oregano dried or from the plant. Many prefer to eat oregano fresh from the garden, and the plant grows well in multiple climates. 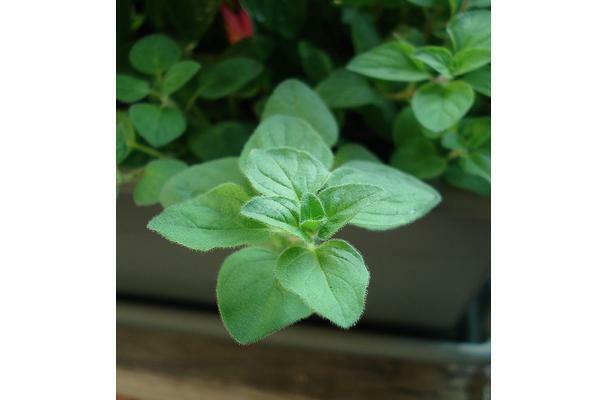 Select an oregano plant that is bushy, has vigorous new growth and has bright green leaves. Choose a pot that is one size larger that the pot in which you purchased the oregano plant. If bringing an oregano plant in from the garden, select a 6-inch pot. Make sure that any pot you choose has a drainage hole. Pot oregano with a quality potting soil to which you've added sand or perlite. A pinch of garden lime mixed in might be a good idea too, but don't over do it. Place pebbles or marbles in the bottom of the pot to increase drainage. Water the plant thoroughly after re-potting, making sure that the soil has been firmed into place to remove air bubbles that can destroy roots. Select a location for your oregano plant that received at least six hours of bright but indirect light each day. If exposed to harsh sunlight, oregano will burn, but it still needs good light in order to thrive. Anything but a northern exposure will work. Choose whether your recipe calls for whole leaves or minced oregano. This depends mainly on other ingredients or just the preference of the chef. Add oregano as needed, and when appropriate, during the cooking. Over-cooking the herb will subdue its flavor. You can even eat oregano "green" with cold dishes. Ask an Italian chef. The use of oregano can be explained by those who regularly make the dishes it complements. A little advice from an expert can give you a more nuanced understanding about how to use this popular herb. Refrigerate fresh oregano in a plastic bag up to 3 days. Store dried oregano in a cool, dark place up to 6 months. History: Oregano, also known as wild marjoram, is an aromatic, spicy Mediterranean herb sold as fresh sprigs or chopped dried leaves. This popular herb is used to season all types of savory dishes, especially tomato-based recipes. Aromatic, warm and slightly bitter. Oregano largely varies in intensity: Good quality is so strong that it almost numbs the tongue, but the cultivars adapted to colder climate have often unsatisfactory flavor. It belongs to the Labiatae family and bears attractive white to purplish flowers and showy bracts in summer. Oregano tends to be quite variable when grown from seed. Leaves are green to gray-green and may be hairy or smooth. Many species contribute to the oregano herb of commerce, to the extent that oregano should be considered more a flavor than a particular species. European oregano is generally derived from O. vulgare, but other species, particularly O. heracleoticum, Coridothymus capitatus (syn. Thymus capitatus) and T. mastichina are also used. Mexican oregano (sometimes known as Mexican sage) is derived mainly from Lippia graveolens, but other Lippia species and Coleus, Lantana and Hyptis species contribute to herb of commerce. O. vulgare is widely distributed through Europe to central Asia. Other species mentioned tend to have a more restricted range in western Europe and the Mediterranean region. Oregano herb of commerce sometimes contains flowering tops of plants, but superior quality material generally contains only leaf material. Crop harvest should be carried out before too many yellow leaves appear in the base of the crop and before flower buds appear. Multiple harvests are possible in a season.